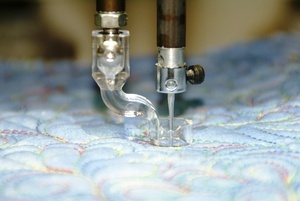 The Clarity mid/longarm foot fits any mid or long arm machine that uses the Handiquilter handifeet system. This includes the Babylock Tiara I, II, and III, Coronet, Regalia, and Crown Jewel series; Huskavarna-Viking Platinum 16; and the Handiquilter Sweet 16, simply 16, Amara, Avante, Fusion, and Infinity. to the top of your throat plate. See Where You Have Been; Know Where You Are Going! Made with a strong polycarbonate material, visibility you can see around and throughout. You spend a lot of time marking your design elements on your quilt, now you can see where you are needing to go at all times. This foot can be used with straight or curved rulers, and both outside and inside areas of templates. Clarity ruler Foot, A Clear Option by Patsy Thompson. 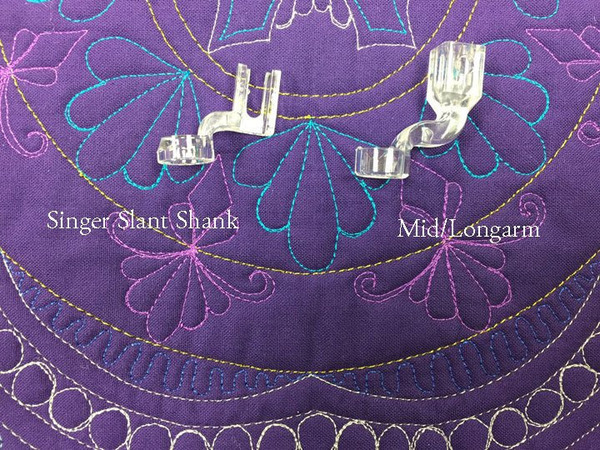 Brief video introducing the Clarity Foot, a new ruler foot for sit down, push through quilting, made of clear acrylic by Accents in Design. Since it is clear you can easily see through it to see your markings and your stitching as you proceed. No more obstruction by metal ruler feet. This foot fits nearly all domestic machines and will be a great addition to your quilting arsenal! Check out this video by Jeanne Harrison demonstrating the new foot. NOTICE: We stand behind our product, if there is any issue we will replace the product. That being said the Clarity Foot is produced from polycarbonate material which is extremely strong. We have sold literally thousands of the Clarity Feet. We have accounts all over the international stage, as well as a strong presence in the US. We have not had one Clarity Foot returned due to breakage. 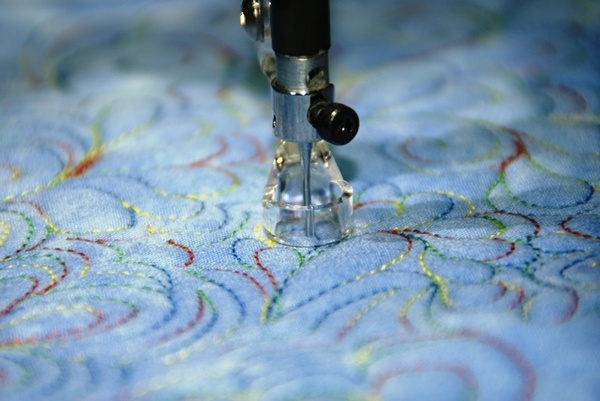 If it were an issue we would not have the Professional Quilter's endorsements that we do for our product. Note: The Fine Line Clarity Ruler Foot is also available for domestic machines. The Clarity ruler foot is very affordable in comparison to others on the market. Note: The Fine Line Clarity Ruler Foot is not available for long arm machines. It is designed for domestic home machines only. The makers of the Clarity Ruler Foot have just debuted 2 new specialty Clarity ruler feet! We took all the pros and cons of many quilting ruler feet on the market, talked with hundreds of quilters using many different makes/ models of domestic machines, and set our sights on the perfect ruler foot. CON #1 Visibility: Quilters were not happy with having to change back and forth from ruler foot to free-motion quilting foot. Ruler feet on the market are made of metal and they do not provide you with much visibility. PRO #1 Visibility: The “Fine Line” Clarity Ruler Foot is photo quality clear. Made with a strong polycarbonate material, visibility you can see around and throughout. You spend a lot of time marking your design elements on your quilt, now you can see where you are needing to go at all times. No more changing out your ruler foot. You can do all your ruler work and jump right back into free-motion designs. CON #2 Affordability: Many quilters we talked with were not happy about the cost of ruler feet. Most ruler feet on the market are priced upwards of fifty dollars. PRO#2 Affordability: The “Fine Line” Clarity Ruler Foot is priced so all quilters can be included in this wonderful design world of ruler work. Our foot can be used with straight, curved, outside templates and inside templates.